The 12-month forecast through August 2018 (above) indicates a vast pocket of exceptional deficits in central Brazil along with pockets in the northeast and west. Deficits of lesser severity are forecast in the eastern part of the country north of Rio, and both deficits and surpluses are forecast in the eastern Amazon. Intense deficits are also forecast along a path in Bolivia from Cochabamba south, around the Gulf of Corcovado in Chile, and nearby along the Chubut River in southern Argentina. Surpluses are forecast along Venezuela’s northeast coast trailing down through Guyana and Suriname, in central Colombia, central Peru, central Bolivia, La Pampa and Buenos Aires Provinces in Argentina, and in southern Patagonia. The northeastern Brazilian state of Ceará has declared a state of emergency in 41 municipalities, including the state capital Fortaleza, due to extreme drought and associated water supply problems. The state has formally requested federal aid to help deal with the crisis. Drought has strained Brazil’s northeastern states, who account for over 70 percent of nearly 1,300 declared states-of-emergency in the nation this year. Soybean futures are at an eleven-week low with forecasts of additional rain in Argentina’s drought-hit farm belt. Argentina is the world’s top soymeal exporter. The mid-December rains allowed the second half of the season’s planting to resume in what were otherwise parched soils which delayed the season’s planting schedule. The Bolivian federal government is digging deeper for sources of potable water as potential drought looms for a second straight year. Using loans totally US$75 billion from the Inter-America Development Bank and the South Korean government, projects comprising a series of wells outside the capital city of Sucre were recently opened with the aim of supplying local reservoirs. Over the past two months drought has destroyed over 15,000 cattle and 33,000 hectares (81.5 thousand acres) of crops. Last year water services were restricted in La Paz, home to 800,000 people, due to the severe drought. As is noticeable in the map progression, the extent of exceptional deficits is forecast to diminish considerably over the next three months. However, large pockets of exceptional deficit remain in the forecast for the western Amazon Basin, and from the State of Acre in western Brazil through the center of the country, including Rondônia, Mato Grosso and Tocantins. Moderate to severe deficits are forecast for the Northeast region and deficits could reach extreme to exceptional severity in Rio Grande do Norte, Paraíba, and Pernambuco. Surpluses are forecast in Mato Grosso do Sul and into neighboring Central-West states. Elsewhere on the continent, deficits of varying severity are expected in northwestern and southern Venezuela; French Guiana; coastal Ecuador; south-central Peru; along a path in Bolivia from La Paz through Cochabamba and into Argentina; from the Gulf of Corcovado in southern Chile reaching east along the Chubut River in Argentina; and Tierra del Fuego. These deficits could reach exceptional intensity in Bolivia, the Gulf of Corcovado, and along the Chubut River. Surpluses are forecast for Venezuela’s northeast coast, trailing into northern Guyana; a large pocket in central Colombia; a small pocket surrounding the city of Piura on Peru’s northern coast and in Huánuco Province in north-central Peru; central Bolivia; eastern Paraguay; La Pampa Province, Argentina; and surrounding O’Higgins Lake (San Martin Lake) in western Patagonia. These surpluses are expected to be exceptional in La Pampa and Patagonia. In the following three months – March through May – the most noticeable change in the forecast is the emergence of widespread moderate to extreme surpluses across the northern Amazon Basin reaching into eastern Colombia, much of Venezuela, Guyana, and Suriname. Surpluses are also forecast during this period in Mato Grosso do Sul and western São Paulo States, Brazil; central Paraguay; La Pampa, Argentina; and Patagonia. 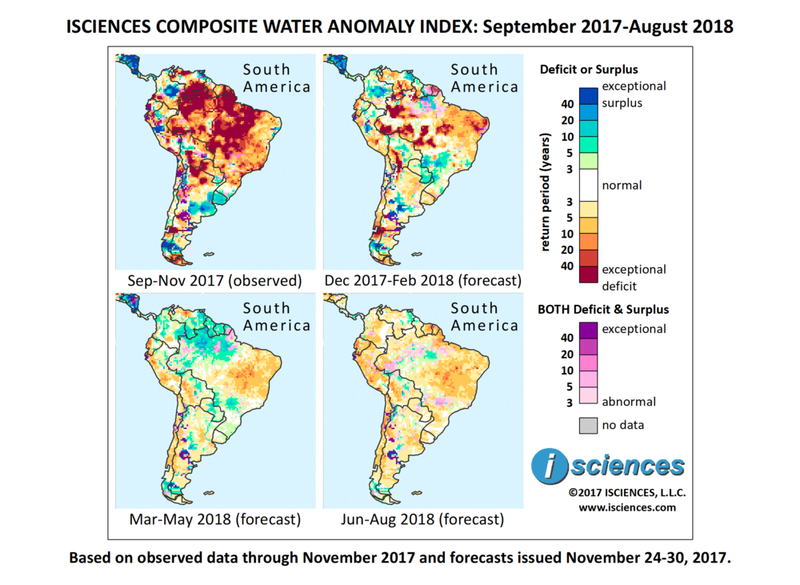 Moderate to severe deficits are forecast for Brazil’s Northeast Region; Guárico Province, Venezuela; western Ecuador; western Peru and much of southern Peru; western Bolivia; and northern Chile into western Argentina. These deficits are expected to be severe in Guárico, Venezuela; Ecuador; and Tocantins, Brazil. In the final quarter, June through August, primarily moderate water deficits are forecast for many parts of the continent.